Review: 4.5 Stars - Descended By Blood, a self published title from author Angeline Kace is the first in an epic new series. Fantastic characters? Yep! Exciting story? Check! Vampires? Oh, yeah! All of the above and so much more can be found within the covers of this book. Brooke and her mother have moved around a lot over the years and being settled in one small town for the last two is all that she’s ever wanted. With an incredible best friend and the boy she has a crush on finally coming around… everything she’s dreamed of is finally all falling into place. She’s an entertaining teen character who is faced with a sudden string of events giving her a ton to deal with in such a short period of time. She’s strong, funny and has a so much to offer to everyone who reads her story. I loved the relationship she has with her best friend and how the two deal with issues and are there for each other. Brooke is not your typical girl in more ways than one and it’s her relationships that give her strength. And then we have her crush Jaren. What can I say about Jaren? He’s not my favorite character; to me he needed a bit of a backbone and started to grow one a bit too late if you ask me. I understand he’s been thrown into a whirlwind of events he never saw coming, but he wasn’t alone with the drastic changes that were happening around him. I wanted to like him, but the more I read the more he just wasn’t for me. When Mirko comes into the story things really picked up and my love for the book and the characters grew instantly. He’s a great guy, a little bit cocky, funny, caring and all around entertaining. The interaction between Brooke and Mirko was always welcomed and yep, loved it! I couldn’t get enough! With the… stuff hitting the fan and how quickly things turned all around and upside down and backwards before kind of, maybe a bit… okay not really righting itself will make your heart catch a bit. The whole story is pretty fast paced but it takes on a whole other meaning when all the action starts and the vampires enter the story. That’s one thing about Kace’s vampires, is that they are different and I appreciated the story more once I found out just how she put her own spin on a creature that has many fans. 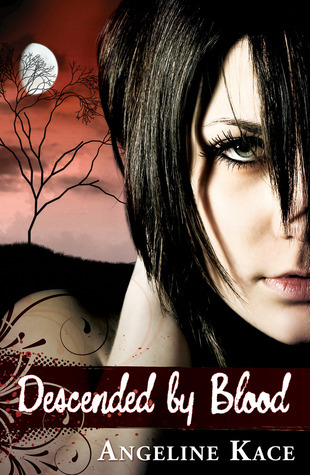 All in all Descended By Blood is the first in a series that’ll instantly leaving you wanting and ready for more. Amazing characters, interesting, fast paced and thrilling story with a massive cliffhanger… what more can you ask for? Well, I’ll tell you what I’m asking for… the sequel! Looking for a great story and characters with a new twist on vampires? Well this one fits that bills perfectly, enjoy! Ive seen a bunch of really good reviews for this book. I need to check it out!